The South Pacific coast of Costa Rica is one of the wildest and least visited regions in the country. The area is covered in rainforest that extends to some of the most beautiful beaches one could imagine. The zone starts to the north at Dominical which is a fun little surf village with dirt roads and a lot of character. Uvita, to the south of Dominical, is the main entrance to Marino Ballena National Park which is home to spectacularly beautiful beaches and also a major breeding zone for Humpback whales during a few months every year. 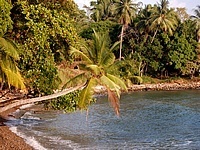 The Osa Peninsula is home to Corcovado National Park, which is one of the most biologically intense areas in the world. Drake Bay and Puerto Jimenez are the best home bases for accessing the park, though most prefer Drake for the amazing beaches, access to Cano Island and nicer lodges. 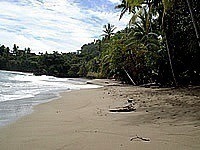 Click on the links to read more about the South Pacific coast of Costa Rica. Dominical is one of the most scenic beach areas in the country. Rainforest lined mountains with clouds covering the peaks create an amazing backdrop for this beautiful area. The beaches here are usually deserted with the exception of the main surfing area in front of town. Surfers congregate to Dominical for the big waves, which has created an interesting cultural fusion with the local Ticos. The dusty unpaved roads of Dominical are lined with restaurants, bars, surf shops and souvenir stands. Combines well with: Turrialba Volcano, San Gerardo de Dota, other South Pacific destinations. Drake Bay is not only the best way to get to Corcovado and Cano Island, but also home to some of the most beautiful beaches in Costa Rica. The area requires a substantial investment of money, time, or both to reach, but is well worth it. Most visitors to Drake Bay come to visit Corcovado National Park and Cano Island, but when conditions are right, snorkeling Playa San Josecito can be just as rewarding. 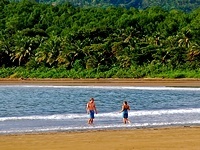 Uvita and Marino Ballena National Park are home to some of the most gorgeous beaches in the country. The beaches are all located within the national park, which protects the pristine beauty of this area, but also means you are required to pay a 10USD entrance fee daily to access the beach. 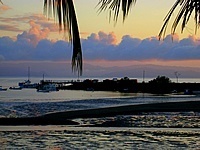 The village of Uvita is spread out, but there are plenty of small restaurants, bars and shops. Puerto Jimenez is another Osa Peninsula destination which requires a substantial investment of money, time, or both to reach. This rootin tootin village is the final outpost before entering the wilds of the eastern flank of Corcovado National Park. The beaches of the pueblo are not the best, but there a couple nice beaches a little north and south of town. Sierpe is considered to be the entrance to the Osa Peninsula. 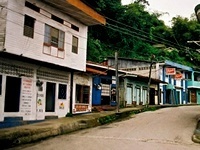 This small sleepy village is located along the Rio Sierpe, where many visitors board boats headed to Drake Bay. The people of Sierpe are as warm and welcoming as one could ever encounter, always greeting you with a smile. San Vito is a quiet town located in the mountains of southern Costa Rica. The area is known for its natural beauty, rich farm lands and hardworking people, which are often of Italian descent. 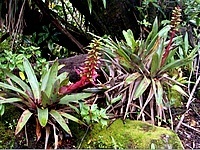 Visitors to San Vito usually come for the atural wonders of the Wilson Botanical Gardens and Las Cruces Biological Station. 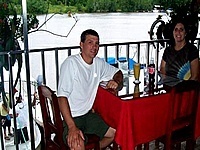 Golfito is a port town located on the eastern side of the Golfo Dulce. The area is not often visited by tourists, but is one of the best bill fishing ports in the world. There is a lawless feel to the town and much of it is run down.